I’m happy to release video of the talk I gave throughout the 2016-2017 school year, including at the NCTM Annual Convention in San Antonio, TX. This is my best attempt to tie together and illustrate terms like “intellectual need” and expressions like “if math is aspirin, how do we create the headache.” If you’re looking for an elaboration on those ideas, or for illustrations you haven’t seen on this blog, check out the video. This approach to instruction seriously taxes me. That’s because answering the question, “Why did mathematicians invent this skill or idea?” requires a depth of content knowledge that, on my best days, I only have in algebra and geometry. So I’ve been very grateful these last few years to work with so many groups of teachers whose content knowledge supplements and exceeds my own, particularly at primary and tertiary levels. Together we created the Directory of Mathematical Headaches, a collaborative document that adapts the ideas in this talk from primary grades up through calculus. It isn’t close to complete, so feel free to add your own contributions in the comments here, by email, or in the contact form. 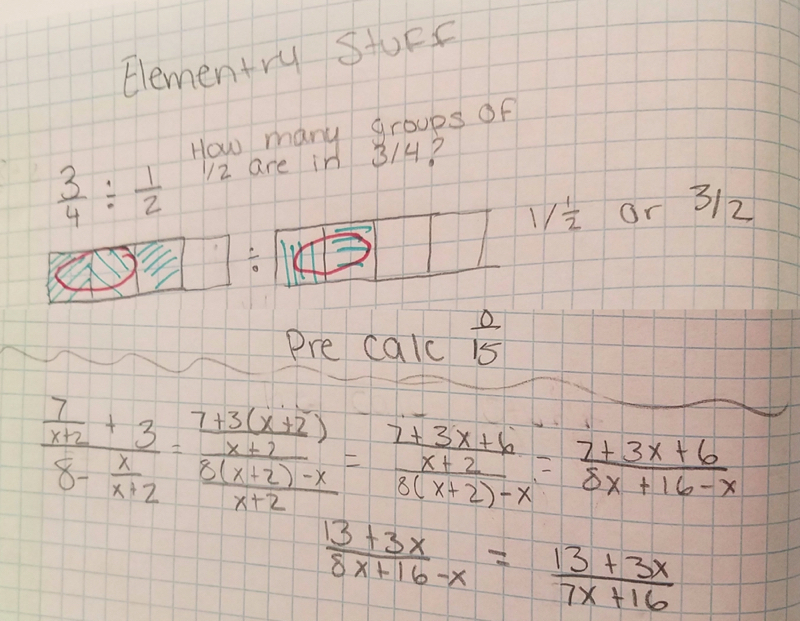 Lisa Bejarano’s post Two Kinds of Simplicity offers a useful idea about teaching complex fractions, but much more interesting to me are the three kinds of knowledge she puts to work in her class. Lisa has read widely from sources online and offline and has a great memory. So when she asks herself, “How am I going to teach [x]?” she can quickly summon up all kinds of helpful posts, essays, books – even the mental recording of previous classes she’s taught on [x]. I stopped to think about how this would work with my class. Lisa has taught long enough and knows her students well enough that she can test each of those resources out in her head, all during the lunch break before class. You can see her swiping right and left on each of them – “Yeah, maybe this idea. Definitely not that one.” – as she sees her students in her imagination. I’m sure Lisa is open to the possibility that her flesh-and-blood students will differ in surprising and awesome ways from her mental model of those students. I wouldn’t bet against her intuition, though. She ultimates decides to start her precalculus students with the elementary school analog of their lesson, turning an abstract fraction division problem into a more concrete one. Then, as her students acquaint themselves again (or in some cases for the first time) with helpful models for that division, she builds back up to the abstract version of her task. I don’t know if it’s possible to practice what Lisa is doing here. It’s knowledge, the tightly connected kind you get when you spend thousands of hours in math classes, reflect on those observations, write about them, talk with other people about them, and then use them to inform what you do in another math class. It’s possible, even easy, to spend the same number of hours without acquiring that tightly connected knowledge. It’s something special to see it all put to use. BTW. My guess is a lot of those knowledge connections were tightened because Lisa is a dynamite blogger. On that theme, let me recommend The Positive Effects of Blogging on Teachers, an article which does a great job describing ten reasons why teachers should think about blogging. It’s wonderful to be here. I spend most of my days with people who don’t fully get me. Wife, friends, dog – none of them gets me like you get me. None of them understands the feeling of mathematical epiphany that motivates my professional life, the sudden transition from not knowing to knowing. One of my earliest mathematical epiphanies was the realization that if you let the number of sides on a regular polygon increase without bound, you get a circle. And that all the relationships you find in a regular polygon have analogous relationships in a circle. For me, that realization was literally a religious experience. I finished that limit on the back of a church bulletin while a churchlady glared at me. So on the one hand it’s great to be in this room – I am among my people – but on the other hand it’s really uncomfortable to be here because you all make me really aware of my privilege, and aware of how many people are not in this room. 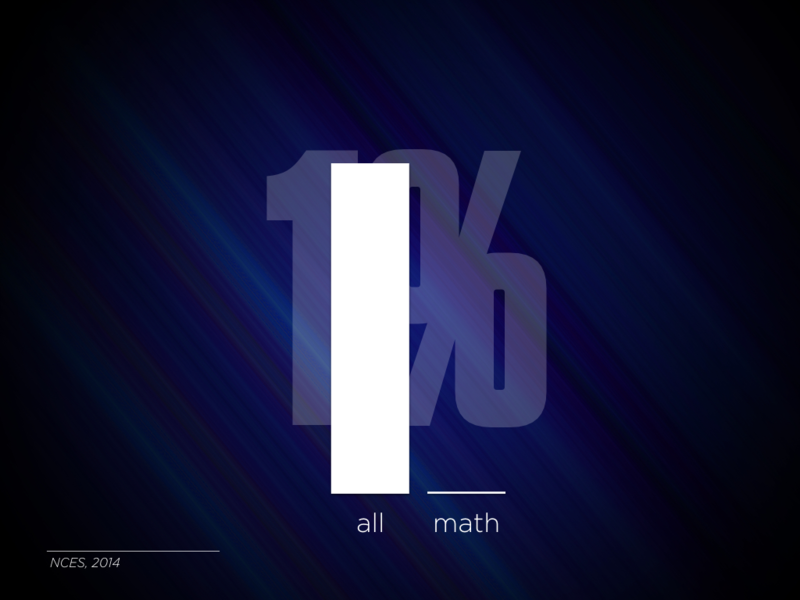 The economic 1% gets a lot of grief lately and whether we know it or not, whether we like it or not, we are all also in the 1% – the mathematical 1%. In 2014, 2.8 million degrees were awarded in US universities – bachelors, masters, and doctorates – and 1.1% of them were in mathematics. If you change the denominator to reflect not advanced degree holders but anyone with a high school diploma our elitism becomes even more apparent. 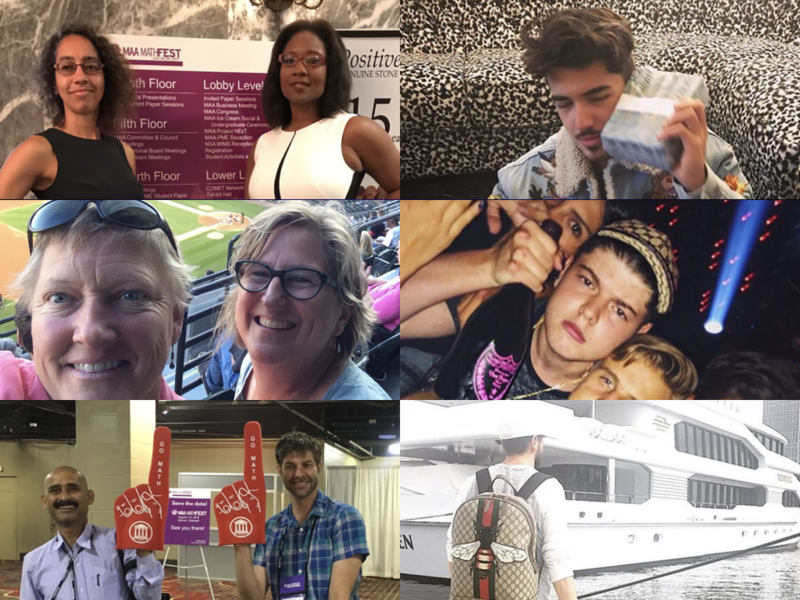 I was on Instagram last night checking out the #MAAthfest hashtag along with The Rich Kids of Instagram. While there are fewer yachts, bottles, and shrink wrapped stacks of bills on the left, and maybe more plaid and elbow patches, there is still the same exuberant sense of having arrived. We have made it. 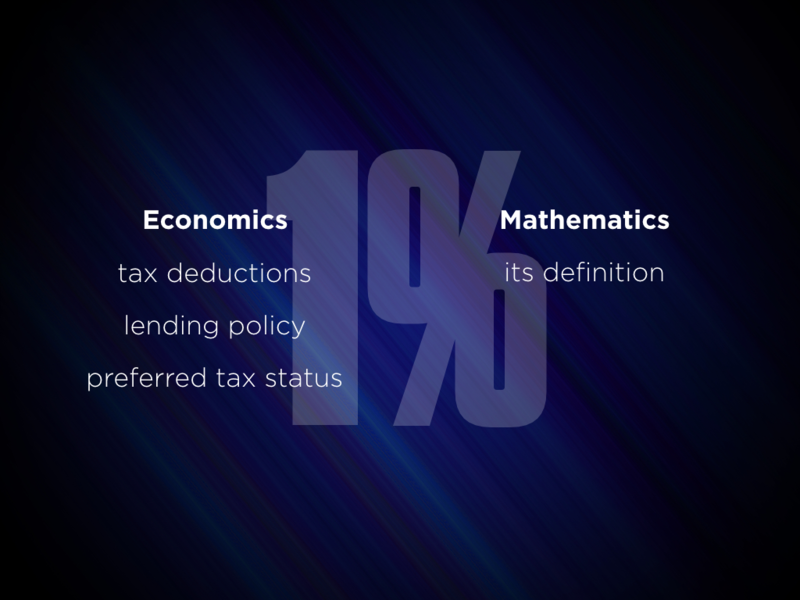 And just as the economic 1% creates systems that preserve its status – policies like the mortgage interest deduction for homeowners, discriminatory lending policies, and lower taxes on capital gains than income – through our action or inaction we create systems that preserve our status as the knowers and doers of mathematics. When someone says, “I’m not a math person,” what do you say back? Barring certain disabilities or exceptionalities, everyone starts life a math person. Infants can recognize changing quantity. Brazilian street vendors develop sophisticated arithmetic algorithms before they set foot in school. It is our action and inaction that teach people they are not mathematical. So please consider taking two actions to extend your privilege to the other 99% of humanity. First, change the definition of mathematics that people experience. Mark an arbitrary point P on a line segment AB. Let AP form the perimeter of a square and BP form the circumference of a circle. Find P such that the area of the square and circle are maximized. That experience offers people only a certain kind of mathematical work. You recall what you know about perimeter, circumference, and area, compute it, and verify it in the back of the book. Those verbs are our mortgage interest rate deduction, our discriminatory lending policy, and our tax advantages. Through our action and inaction, society has come to understand that math is a merry-go-round revolving endlessly through those three verbs – remember a procedure, compute it, verify it. You might think, “Well that’s what math is,” but the definition of math isn’t a physical constant in the universe. It’s defined by people, just as people define the ways that wealth and power accrue in the world. That definition is then underlined, reflected, and enforced in public policy, curriculum, and syllabi. So, second, let’s change the definition of mathematics in public policy, curriculum, and syllabi. 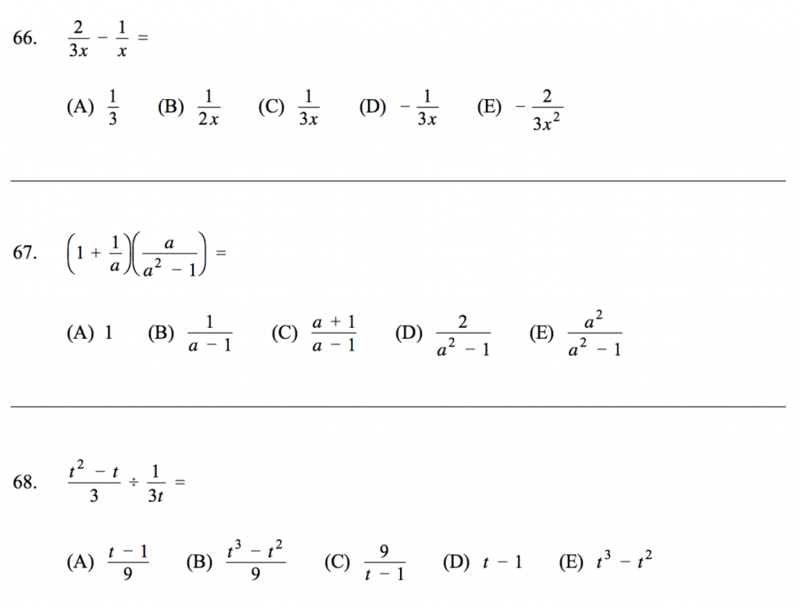 To begin with, let’s eliminate policies that require intermediate algebra for college study. College completion is increasingly essential to even partial economic participation. Students fail these exams in staggering numbers (68% nationally) placing into “developmental math” courses, courses which cost time and money and don’t offer credit towards graduation. Those courses are disproportionally composed of African American and Latinx students. Only 32% of students in developmental math ever take a math course required for graduation. 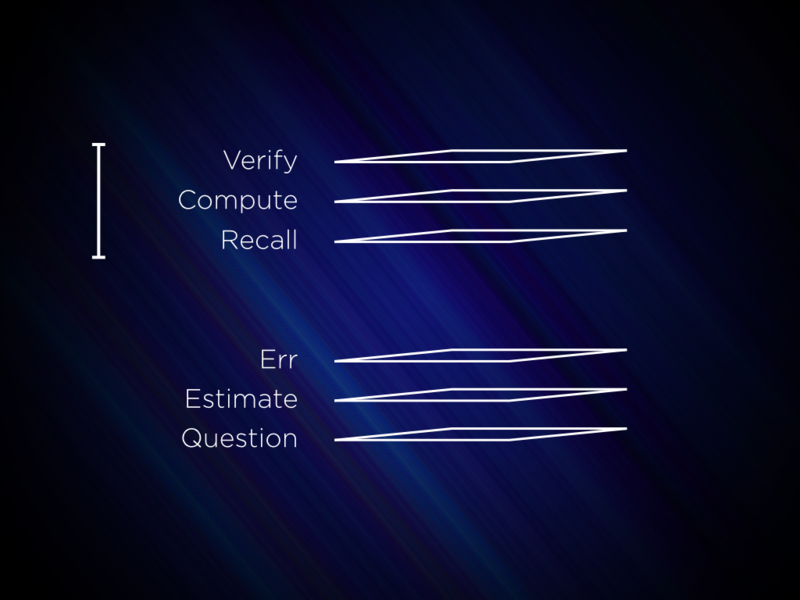 It’s hard to imagine a machine more perfectly configured for the preservation of mathematical privilege. I am sympathetic to the argument, however, that we shouldn’t choose college requirements solely because they’re useful professionally. College should offer students a broad survey of every discipline – a general education, as it’s called. That survey should generate intellectual interest where perhaps there was none; it should awaken students to intellectual possibilities they hadn’t considered; it should increase the likelihood they’ll speak favorably about the discipline after college. When 907 CUNY students were assigned either to remedial algebra, remedial algebra and supplementary workshops, or college-level statistics and workshops, that latter group a) passed their course in greater numbers (earning credit!) and also b) accumulated more credits in later courses. So we should be excited to see the California State University drop its intermediate algebra requirement for graduation. We should be excited to see a proposal from NCTM that reserves intermediate algebra concepts for elective courses in high school. But we should regard both proposals as tenuous, and understand that as people of privilege, our support should be vocal and persistent. We can choose action or inaction here. Through your action, the definition of math may change so that it’s accessible to and enjoyed by many more people, so that many more people understand themselves to be “math people.” I want to be clear that our own privilege will diminish as a result, that we will become less special, but that humanity as a whole will flourish. Through your inaction, or through your tentative, private support for initiatives like these, the existing definition will endure, along with the existing distributions of privilege. Choose action. Three years after the intervention, although 17% of the traditional remedial group had graduated, 25% of the statistics group had done so (almost 50% more students). To graduate, students had to pass, not only their general education quantitative requirement (which could be satisfied by college algebra or statistics), but also their social and natural science course general education requirements. So, for many students, passing remedial algebra was not necessary in order to pass these other courses. Further, there were no differences in our results in accordance with students’ race/ethnicity. Given that Black and Hispanic students are more likely to be assessed as needing remediation, our results mean that our procedure can help close graduation rate gaps between underrepresented and other students. At Desmos, we’re now asking ourselves one question about everything we make: “Will this help teachers develop social and creative classrooms?” We’ve chosen those adjectives because they’re simultaneously qualities of effective learning and also interesting technology. We’ve upgraded three activities (and many more to come) with our new Challenge Creator feature: Parabola Slalom, Laser Challenge, and Point Collector: Lines. Previously, students would only complete challenges we created. Now they’ll create challenges for each other. The results from numerous classroom tests have been – I am not kidding you here – breathtaking. Near unanimous engagement. Interactions between students around mathematical ideas we haven’t seen in our activities before. Why are students so engaged by their tablets, phones, and laptops outside of class and so bored by them inside of class? It’s the same device. But in one context, students are generally enthusiastic and focused. In the other, they’re often apathetic and distracted. At Desmos, we notice that, outside of class, students use their devices in ways that are social and creative. They create all kinds of media – text messages, videos, photos, etc. – and they share that media with their peers via social networks. You might think that comparison is unfair – that school could never stack up next to Instagram or Snapchat – but before we write it off, let’s ask ourselves, “How social and creative is math edtech?” What do students create and whom do they share those creations with? In typical math edtech, students create number responses and multiple choice answers. And they typically share those creations with an algorithm, a few lines of code. In rarer cases, their teacher will see those creations, but more often the teacher will only see the grade the algorithm gave them. For those reasons, we think that math edtech is generally anti-social and uncreative, which explains some of the apathy and distraction we see when students use technology inside of class. How can we help students create mathematically in more diverse ways? So we invite students to create parking lots, scale giants, mathematical arguments, tilings, sketches of relationships, laser configurations, drawings of polygons, tables, stacks of cards, Marbleslides, informal descriptions of mathematical abstractions, sequences of transformations, graphs of the world around them, and many more. How can we help teachers and students interact socially around those creations? So we collect all of those creations on a teacher dashboard and we give teachers a toolkit and strategies to help them create conversations around those creations. It’s easier to ask your students, “How are these two sketches the same? How are they different?” when both sketches are right in front of you and you’re able to pause your class to direct their focus to that conversation. Today, we’re releasing a new tool to help teachers develop social and creative math classrooms. Previously in our activities, students would only complete challenges we created and answer questions we asked. With Challenge Creator, they create challenges for each other and ask each other questions. 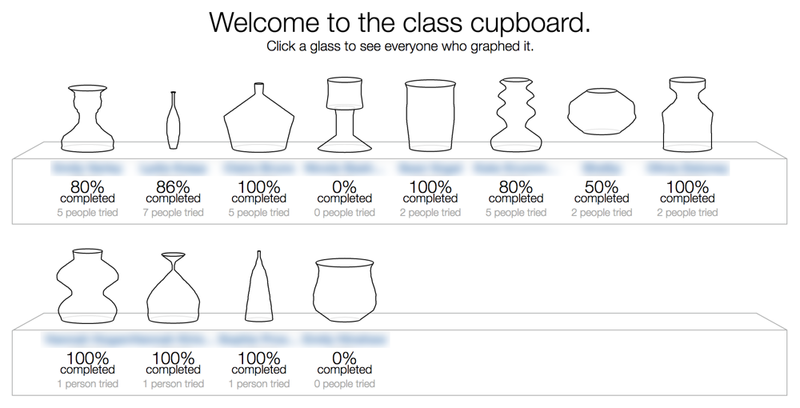 We tried this in one of our first activities, Waterline, where, first, we asked students to create a graph based on three vases we gave them. And then we asked them to create a vase themselves. If they could successfully graph the vase, it went into a gallery where other students would try to graph it also. We began to see reports online of students’ impressive creativity and perseverance on that particular challenge. We started to suspect the following: that students care somewhat when they share their creations with an algorithm, and care somewhat more when they share their creations with their teacher. But they care enormously when they share their creations with each other. So we’ve added “Challenge Creators” to three more activities, and we now have the ability to add them to any activity in a matter of hours where it first took us a month. In Parabola Slalom, we ask students to find equations of parabolas that slip in between the gates on a slalom course. And now we invite them to create slalom courses for each other. Those challenges can be as difficult as the authors want, but unless they can solve it, no one else will see it. In Laser Challenge, we ask students to solve reflection challenges that we created. And now we invite them to create reflection challenges for each other. In Point Collector, we ask students to use linear inequalities to capture blue points in the middle of a field of points. And now we invite them to create a field of points for each other. Screams and high fives so enthusiastic you’d think we were paying them. I’m not saying what we saw was on the same level of enthusiasm and focus as Instagram or Snapchat. But it wasn’t that far off, either. As with everything else we make that’s free for you to use now, we will never charge you for it. Will we be able to create our own Challenge Creators? Eventually, yes. Currently, the Triple C (Challenge Creator Creator, obv.) has too many rough edges to release widely. Once those edges are sanded down, we’ll release it. We don’t have a timeline for that work, but just as we think student work is at its best when it’s social and creative, we think teacher work is at its best under those exact same conditions. We want to give teachers the best toolkit possible and enable them to share their creations with each other. What effect does asking a student to create a challenge have on her learning and her interest in learning? What sorts of challenges are most effective? Is this approach just as effective for arithmetic expressions as laser challenges? Does posing your own problem help you understand the limits of a concept better than if you only complete someone else’s problems? Researchers, grad students, or any other parties interested in those same questions: please get in touch.